Ever the reality show Where Are We Going, Dad <爸爸去哪兒> became a major success, many television stations started up their own variations of the show, including Dad is Back <爸爸回來了>, and Super Mom <媽媽是超人>. However, China recently decided that they will be restricting the broadcast of any parent-child reality shows until further notice. Although the 6th season of Where Are We Going, Dad was supposed to air this summer, the show eventually didn’t hit the TV screens. While there has been very limited news about the newest season, the official Weibo account of Where Are We Going, Dad posted a statement back in August stating that the broadcast time for season 6 is currently undecided. Since August, no further announcements have been made. Similarly, Paul Wong’s (黃貫中) daughter, Debbie, was supposed to join him on another reality show, Think of a Plan, Dad! <想想辦法吧爸爸>. Although the production has completed filming, with the touching airport scene between Athena Chu (朱茵) and Debbie being one of the initial highlights of the first season, no news of the broadcast date has been announced either. 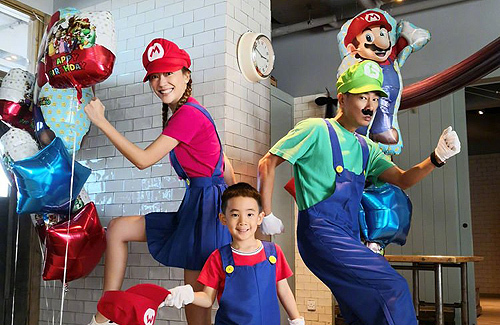 While parent-child reality shows have been all the rave in Mainland in the last couple of years, with fans eager to catch a glimpse into celebrities’ lives with their children, China’s unofficial restriction on these types of programs have put the production teams in a real pickle. Many fans voiced their disappointment, expressing that they were really looking forward to newer shows such as Think of a Plan, Dad. What’s the rationale behind them doing this? Exploiting own kids for big money maybe? maybe the show paints too of a pretty picture of what it’s really like being a parent when in reality it is chaos almost every moment?! Hmmm…this news actually came out a couple months ago…not sure why Cosmo HK is only reporting on it now…. @coralie @jimmyszeto Anyway, I need to go back and look it up, as I don’t remember the wording exactly, but this “restriction” has actually been in place since 2016, it’s just that the enforcement of it has been spotty. In the official announcement that came out from China’s Radio, Film and Television Board back in 2016, their stated rationale for the restriction was to prevent the exploitation of children by celebrity parents – their argument is that when these celebrity offspring go on those reality shows and amass a huge fanbase/following at such a young age, it prevents them (the children) from having a “normal” childhood, which they (the government) claim negatively affects the children’s well-being. This is actually just one of the many restrictions that SAPPRFT put in place relating to the entertainment industry….some of the restrictions make sense but many of them are ridiculous….yes, China is a lucrative market when it comes to entertainment, but it’s also one that’s not easy to maneuver through successfully without good understanding of the various regulations and restrictions…. @llwy12 Thanks for the explanation. So it seems it’s for protective measures, which is fine & dandy…but does that mean they apply this rule to child actors as well? I mean, we know SAPPRT is inept and their rules don’t always make sense, but if they’re going to be consistent, they should be consistent across the board (side note: looks like SAPPRT was abolished since last yr – probably in name only – per this article: https://deadline.com/2018/03/china-film-industry-regulation-communist-party-propaganda-department-1202350328/). I don’t consider it an exploitative practice, but I can see how some can apply this for their own benefit. On the other hand, doing this to protect children’s childhood is a pretty noble aspiration, IF they actually implement this across the board. @coralie That department is still around, they just changed the name and put it under the CCP’s Propaganda department instead of being a separate entity as it was before. I believe the rule does apply to child actors as well, at least that’s what I had read. Technically though, it’s not entirely to protect the children, as the other concern (at least what is stated in the documents) is the bad example it sets for society (more specifically, ordinary kids — meaning non-celebrity offspring — may see these kids on TV getting so much fame and money and because they lack the maturity and life experience to understand what’s going on, they may try to emulate them). So yes, part of it involves “protecting” children, but in a sense, it’s also part of China’s “greater” political agenda of wanting its people to be “model, upstanding citizens”. Celebrity parents are using their kids to revive their fading careers, while the kids are getting abnormal amounts of attention and money and grow up as entitled brats rather than role models. @coralie they are rich enough to not doing one or two projects a year to spend more time with their kids. Bringing their kids on tv to spend time with them is a weak argument. Child actor acts, whereas those reality tv celeb kids just be themselves… and when their bratty but cute behaviours gain attention from the mass, why would they grow up and out of these behaviours? If you look at Hollywood, so many child actors grow up being so terrible, and you feel what a waste of their bright young lives they used to have! @littlefish i see your point, but hollywood doesn’t treat their kid actors very well. most of the time, the kids get used and then discarded once they’re no longer adorable or needed. never giving them enough transition time to cope with the loss. reality shows are different, because it only displays the kids in their natural element in short durations & they have their parents’ to guide them. there’s no faking or feeling of ‘foreverness’ involved. and everyone knows they’ll grow up eventually. and as to the wealth of the parents. true, but we all know celebrities also try to keep up with the joneses. they might be wealthy but in their head they’re thinking of themselves relative to their peers and planning ahead for their families’ needs. so they always think they need more money. and when they want great things for the family, they need the wealth. how often i hear Asian parents say things like, “mom or dad needs to go to work to make money for our baby so they can have the best, etc.” is it right? no, but i can understand & empathize that mentality. it’s not limited to just Asians though. my coworker’s husband (white) grew up in a very affluent family, but he says he’s never seen his dad much while growing up. yet, his father is supporting his siblings’ needs even when they’re all grown up now. i’m not claiming that money is all that matters. but these reality shows allow them to both earn money & spend time with their families. i think that’s not a bad thing, provided that the intention is good. @littlefish In Hollywood, many of these child actors ended up as breadwinner of the family. The parents were perfectly fine using their child as a source of income. As kids, they couldn’t do anything (Mary Kate and Ashley Olsen were babies when they starred in Full House). As they grow up, some of them might end up liking the job but some feel resentful and go far as to legally emancipate themselves from their parents. I have always being against such show. I had lots of angry comment due to it. But the bottom line is, kids live do change. They become celebrities and they and their parents makes lots of money. The kids live is no longer the same. It is not healthy nor normal.